The Palestinians announced a fresh push against Israel at the International Criminal Court on Tuesday, a day after the United States said it was closing their Washington mission partly over the campaign. 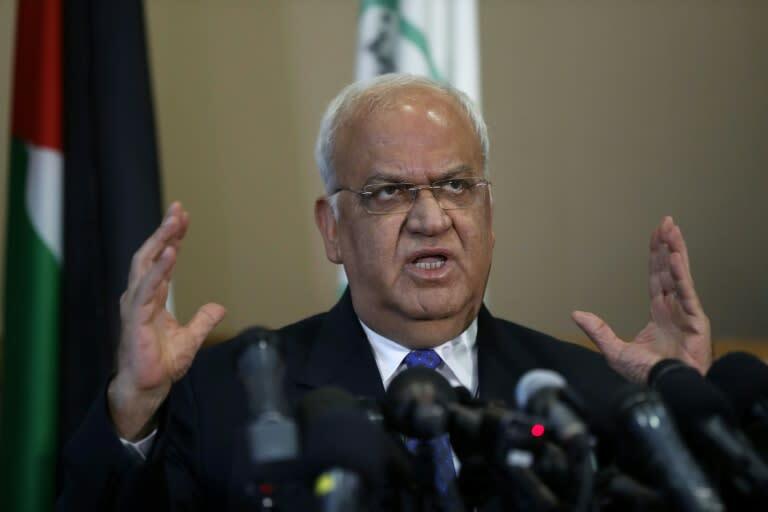 Saeb Erekat, secretary general of the Palestine Liberation Organization (PLO), said it had submitted a new complaint over an Israeli "war crime" against a Palestinian village in the occupied West Bank, expected to be demolished by the Israeli army in the coming days. The dossier "included a focus on the war crimes facing Khan al-Ahmar, specifically the crimes of forcible displacement, ethnic cleansing and the destruction of civilian property," Erekat said. He added that the PLO had also asked the ICC's prosecutor to speed up a preliminary probe into other alleged Israeli war crimes. Khan al-Ahmar is in a key location near Jerusalem. International powers say its demolition could enable Israeli settlement expansion that would eventually cut the West Bank in two, further threatening the prospects of an independent Palestinian state. It could be demolished in the coming days, following an Israeli high court ruling that it was built without the necessary permits. The Palestinians submitted a similar complaint regarding the village in July. The latest submission came a day after the US confirmed it would close the PLO's office in Washington, the highest Palestinian representation in the country, amid worsening relations between the two. The White House cited the Palestinians' ICC campaign and what it said was their unwillingness to negotiate. The Palestinian leadership cut off contact with the administration of President Donald Trump after he recognised the disputed city of Jerusalem as Israel's capital in December. Trump's administration has also cut more than $500 million in aid to Palestinians, including to the UN agency for Palestinian refugees, since January. Palestinian leaders say the administration is blatantly biased in favour of Israel and is seeking to blackmail them into accepting the White House's moves. On Monday, John Bolton, national security adviser to Trump, attacked the ICC, threatening to sanction judges and other officials if they moved against US soldiers or those of key allies. "The US threats against the ICC (are) a coup against the rules-based international system," Erekat. "If you worry about courts, you should not threaten the courts -- you should stop committing crimes or aiding and abetting crimes." The ICC launched a preliminary probe in 2015 into allegations of war crimes and crimes against humanity in Israel and the Palestinian territories, in the wake of the Gaza war the previous year. It has yet to move to the next stage and open a full-blown investigation which could possibly lead to charges.